View of New London Bridge in June 1827. John Rennie, Esq., Engineer by Henry Barlow Carter. 1827. Sepia watercolour, 30.00	x 50.50cm (11.81 x 19.88 inches). Signed and dated 1827. Courtesy of Sarah Colegrave Fine Art. Click on image to enlarge it. Henry Barlow Carter came from Plymouth. It is believed he spent a time in the Navy before becoming a professional artist. In the late 1820s he left Plymouth for London where he lived in Newington and exhibited a number of watercolours at the Royal Academy and Suffolk Street. In about 1830 he moved to Hull to take up a teaching post. On his marriage a few years later he to moved to Scarborough, where he lived for some thirty years and worked as a drawing master. In 1862, following the death of his wife, he moved to Torquay, where he died of bronchitis in 1867. Barlow worked mostly in watercolour and occasionally in oils and was much influenced by Turner. He exhibited at the Royal Academy, British Institution, Suffolk Street and elsewhere. Works by him are in many public collections including the British Museum, Victoria & Albert Museum and National Maritime Museum. The present work was probably executed while Barlow was still in the Royal Navy. It was exhibited at the Royal Academy in 1828, the year after his similar sepia watercolour, NW View of the Menai Bridge, from the Anglesea Shore, Royal Academy 1827, no.889 (location unknown). A comparable watercolour of 1827, Construction of Docks is in the collection of the Victoria & Albert Museum, London and appears to be typical of the work of a naval draughtsman. 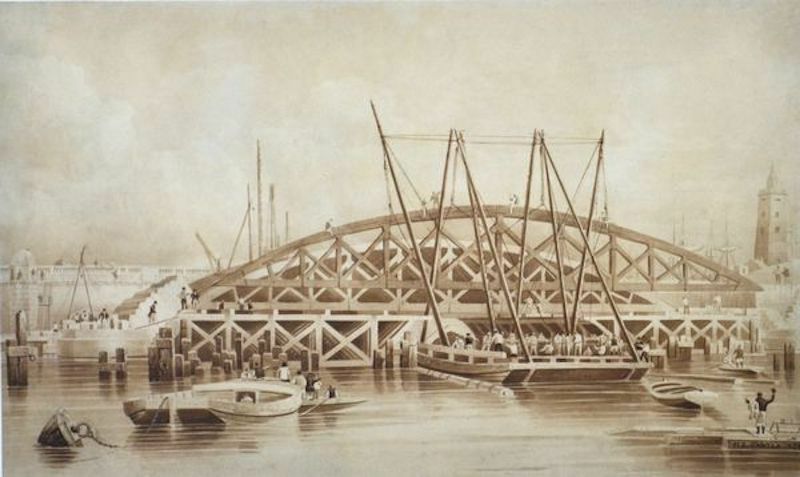 John Rennie’s “New” London Bridge was built up stream of the “Old” London Bridge which remained in service while the new bridge was being constructed. “Old” London Bridge was demolished after the opening of the new bridge in 1831. In 1924 it was discovered that the bridge was sinking and should again be replaced. In 1967 the City of London sold Rennie’s bridge to Robert P, McCulloch of McCulloch Oil and it was removed to the USA where it was reconstructed at Lake Havasu City, Arizona.